Live Media Streaming is by far getting popular among the masses and more number of people are taking deep interest in this transpiring domain. The streaming industry is currently ruled by Google Chromecast, Amazon Fire TV, Apple TV and Roku. Although the streaming domain is still quite new, the competition is rising for sure. 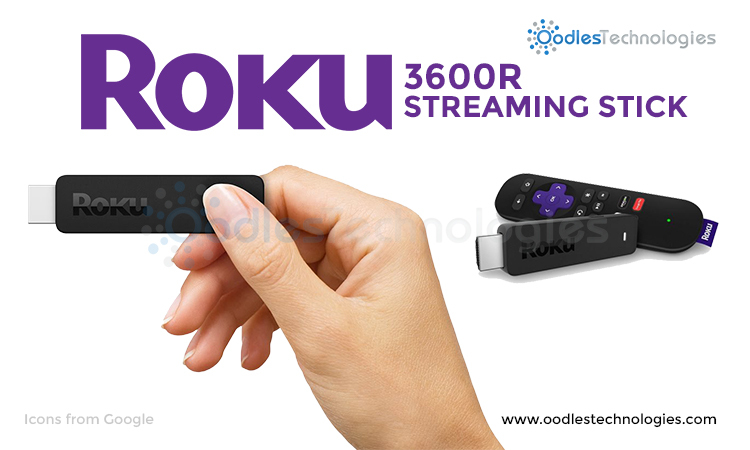 Roku has once again proved its worth by launching an all new Streaming Stick with enhanced processing power and many other stand out features. The new Roku Streaming Stick is now available online and offline at various retailers like Amazon, Walmart and BestBuy at $49.99. The new Roku Streaming Stick (Model 3600R) is the most sleek and portable pocket size streamer ever created by Roku. For its compact size, it encompasses enormous power and is much faster than the previous versions released by Roku or any other Video Streaming Service provider. Roku 3600R is the first pocket-size streaming stick that comes with a quad core processor, making it the fastest streaming device ever created. Roku 3600 streaming stick possesses 8 times more processing power than its predecessors. It provides a great connectivity and excellant quality. There have been some minor changes in design, making it more compact, sleek and stunning. While the previous version had a bright purple covering, Roku 3600R comes in a matte black covering and now it looks quite similar to the Streaming Stick of Amazon Fire TV. Perhaps, not only the outer shell of Roku Streaming Stick has encountered these notable changes but there is a radical change in the underlying components as well. As already mentioned, Roku 3600R is the first Video Streaming Stick to use a quad core processor for 1080p high definition video streaming without any glitches. Apart from that, Roku 3600R uses a 802.11n dual band WiFi antenna which reduces the buffering time and makes the video streaming smooth and much faster. Roku is clearly not alone in the sphere of Live Video Streaming and it faces an enormous competition from numerous competitors like Google Chromecast, Amazon Fire TV and Apple TV. Furthermore, the new Roku stick is more expensive than any other streaming stick. But despite of all this, Roku is still ruling the industry and its streaming stick is better than others in many ways. First of all, Roku 3600R offers a stunning user interface with easy navigation. Then the Quad Core processor definitely adds to the beauty and makes it stand apart from all the other streaming devices. Owing to the 802.11n WiFi support, the streaming is much faster and smoother than the other devices and the buffering delay has been reduced to a great extent. However, there are many things that could have been better. For instance, they could have used the 802.11ac standard by giving a little more efforts in the same way that Google Chromecast has done it. Also, the new remote control device is not much impressive and is very much similar to the previous versions. But apart from all these minor flaws, Roku 3600R is a magnificent device that is definitely going to last long in the market.